As the original door window glass fitted back in the 1960's wasn't laminated or strengthened, if it were to break it could be very dangerous. This replacement window is modern toughened and laminated glass so is perfect for the door should it get caught by the wind. As Portafolds were hand-built, the glass will fit 95% of Portafold doors, but your window aperture may require trimming to get the glass to fit properly. It is highly recommended that you change the window rubber at the same time, as the glass is slightly thicker than the original and the rubber is specifically chosen to fit the new glass thickness and the GRP thickness. 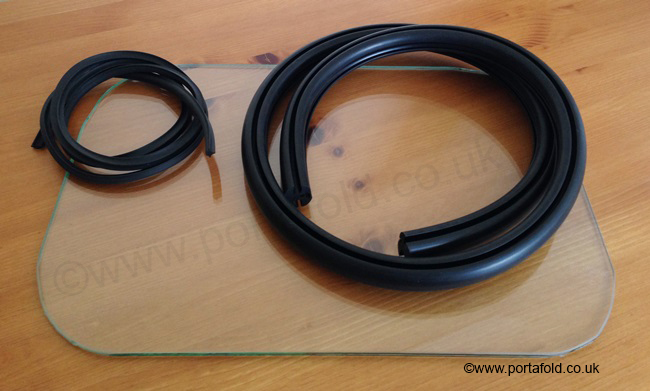 The new window rubber can be found here.